One of Florida's major cities, Tampa is a beautiful destination for travelers of all kinds. Boasting beautiful sunny weather all year long, a stunning skyline, a truly unique bay with luxurious warm waters, and so much more, this is easily one of the Sunshine State's best locations and a must-visit for any Florida resident or tourist. Tampa boasts a whole range of great kayaking locations. Many kayakers immediately tend to head for the bay area, but there are several parks a little further inland offering even more excellent kayaking opportunities. Here are a few of Tampa’s top kayaking spots. If you're looking to do some kayaking in Tampa Bay without sticking to the main bay waters, Little Manatee River is a great choice. Situated just a short drive out of central Tampa, this picturesque little river is lined on both sides by beautiful hanging trees and lush vegetation. The calm, shallow waters provide the perfect base for kayaking adventures and even inexperienced kayakers can simply let themselves glide along and enjoy the sights and sounds of the surrounding forests. One of the best spots for kayaking at Tampa is Hillsborough Bay. Just off the coast of downtown Tampa, these clear, warm waters provide some fantastic kayaking opportunities for both experienced and amateur kayakers. Kayaking is really enjoyable here and plenty of fish and birds can be found along the way, as well as some stunning views of Tampa itself. Head south into Tampa Bay or follow the coastline round to the Old Tampa Bay to make even more memories. 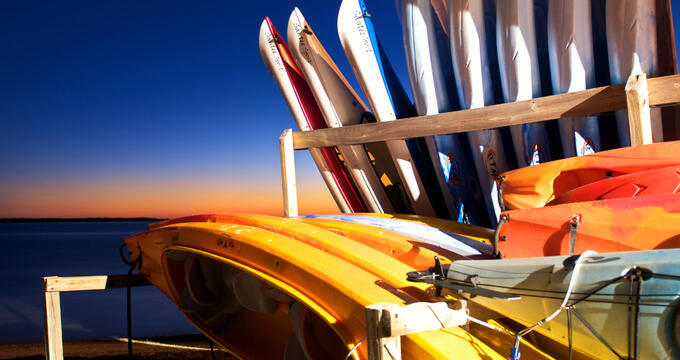 Various kayaking companies have been established in Tampa over the years. Offering a range of services like guided kayaking tours, kayak rentals, kayak outfitting, and more, these companies have only one goal: ensuring that each and every kayak enthusiast in Tampa has a great time out on the water. With that in mind, here are a few of Tampa’s top rated kayaking companies. Offering kayak rentals, tours, lessons, and more, Bay Breeze Paddle Adventures is the number one company for anyone who wants to head and enjoy the warm, welcoming waters of Tampa Bay. Get up close and personal with Floridian wildlife including gentle manatees and friendly dolphins as you explore the mangroves and more. These tours also take in Cypress Point Park and other great locations around the Tampa Bay area and welcome all kayakers, regardless of age or experience. For a different kind of kayaking experience in Tampa, head south of the city to the Wimauma area and locate Canoe Outpost. Offering both canoe and kayak rentals on the Little Manatee River, this company provides small group guided tours along one of the Tampa area's most secluded and scenic kayaking locations. Self-guided tours are also available along the river, with Cockroach Bay and Braden River also being part of the experience and offering some beautiful flat waters and hanging trees to enjoy. Offering a wide variety of guided kayaking tours all around Central Florida and the Gulf Coast, Florida Eco-Adventures is one of the top kayaking companies in the Sunshine State and very well-suited to families with young children. If you want to enjoy the ecological side of Florida and witness the state's native wildlife up close, this is a good company to choose and there are several different river and bay tours to be enjoyed at all times of year.